Johns Hopkins University’s Washington D.C.-based Chinese Students and Scholars Association (CSSA) was recently honored by the Chinese Ambassador to the U.S. as one of the top chapters in the country. The club consists of Chinese students attending programs on the university’s D.C. campus, including the Carey Business School, School of Advanced International Studies, and Advanced Academic Programs. Its mission is to promote community engagement and spread Chinese culture. The club was honored along with five other CSSA chapters in January at a dinner and reception held at the Chinese embassy. 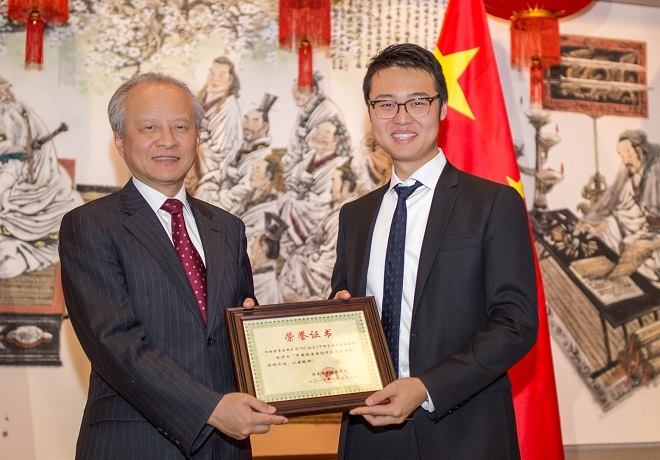 Club president Muduo “Jerry” Zhang, a student in the Carey Business School’s MS in Real Estate and Infrastructure program, was presented with an award by Chinese Ambassador Cui Tiankai. “It was a great honor for us to be recognized,” Zhang said. Zhang said the club was given the award based on a competition where they presented to embassy officials regarding the club’s activities.